Look around and you'll notice.....the world is covered with jagged edges. People are broken all over the place. Places are broken all around us. But we were made for better than this: We were made for shalom. We were made to be whole - and to make things whole. This is an empowering journey for those who hunger for a better life, for a better world....for those who want to plant and grow the seeds of restoration in themselves and their communities.....and for those who want to see the jagged edges made smooth as we move from brokenness to wholeness. Beautifully written, and the honesty in its pages invites the reader's honesty - which is, in my view, one of the best things a book can do. - Shauna Niequist, author of Present Over Perfect. This book forced my to look at others with compassion and gentleness, grace and potential. But more important, it forced me to look inwardly at myself with that same gentle spirit. - Nish Weiseth, Author of Speak: How Your Story Can Change the World. 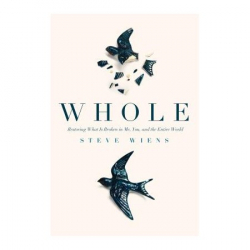 If you dare to ask the soul-enriching questions found in Steve Wien's imaginative work, you just might find yourself on the road to wholeness. - Richard Rohr, Founder of the Center for Action and Contemplation.